My 12-year-old daughter Chloe is obsessed with soccer. The long winters are hard for her, because she can't easily practice her soccer moves in three feet of snow. But, spring has finally come, the snow has finally melted, and she can finally get ready for her soccer season--which begins next week! Not only is Chloe a soccer hero, she is pretty darn creative. When she learned that I was going to be doing a soccer-themed post for POWERADE® and Walmart Fresh Produce, she was all over it. 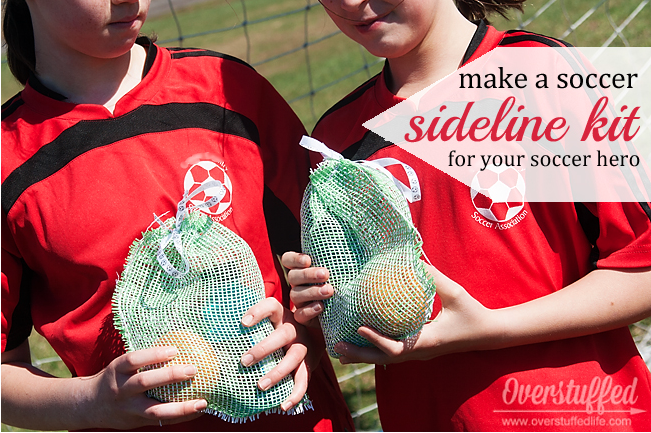 She came up with the idea of mesh bags to hold the soccer snack. She wanted the mesh to remind the players of the soccer goal. 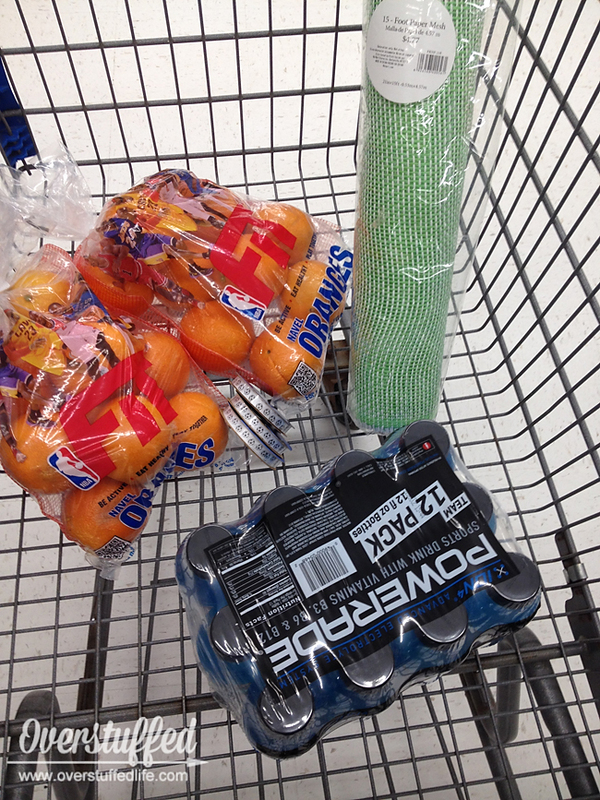 Our first line of business was to head to Walmart to pick up our supplies. 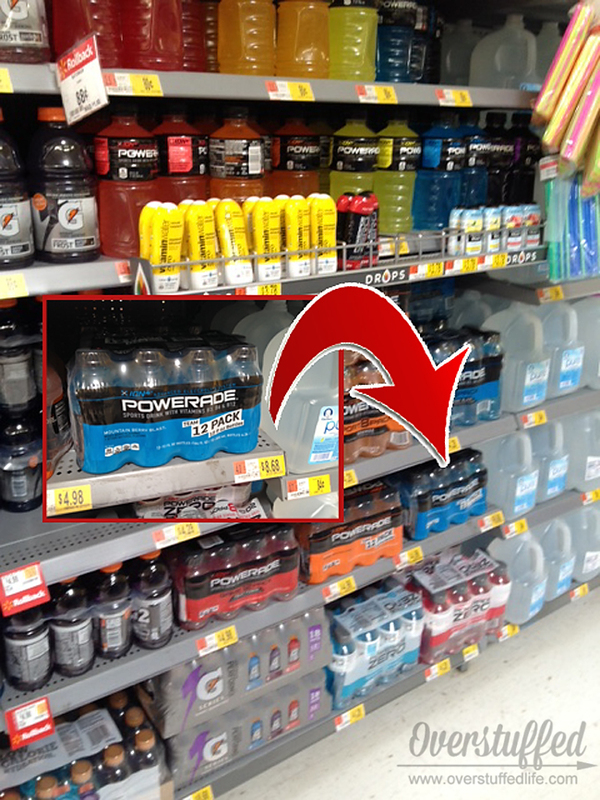 First, we stopped by the beverage (not juice) aisle to pick up a 12-pack of the 12-ounce POWERADE®. Chloe chose the mountain berry blast flavor. Then we picked up some oranges. Chloe chose oranges because she had read that they rehydrate you faster than other fruits. And because they're round like soccer balls. We also stopped by the craft aisle to buy some soccer-themed ribbon and some mesh. 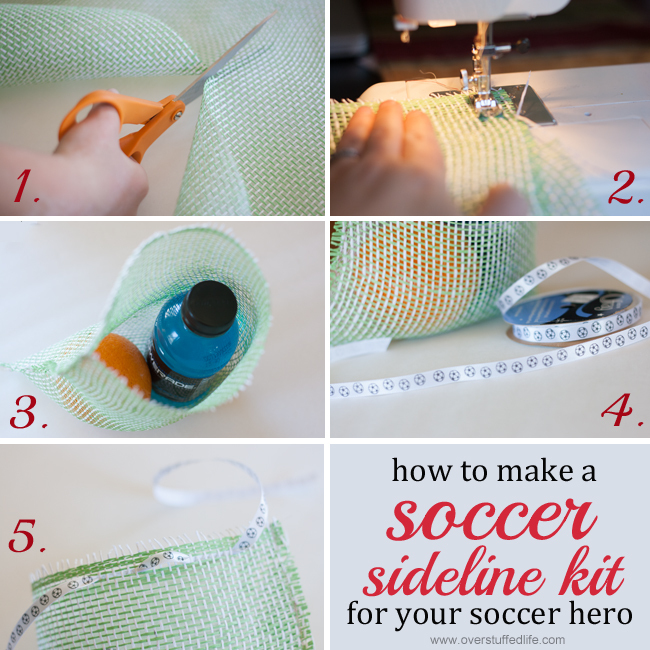 Once we had all the supplies in hand, we went home to make a few fun soccer sideline kits for Chloe and her friends (simple tutorial is at the end of this post). Chloe was so excited to go pick up her best friend and head down to the soccer fields so they could work on their moves for the upcoming season. It was a beautiful spring day, and even though the grass wasn't greened up yet and there was a little mud, the two of them had a blast together! As a soccer mom, I always appreciate the parents who bring fruits and vegetables as a soccer snack instead of processed foods. The kids just feel better after all that hard play to eat something healthy and hydrating instead of crackers or fruit snacks. 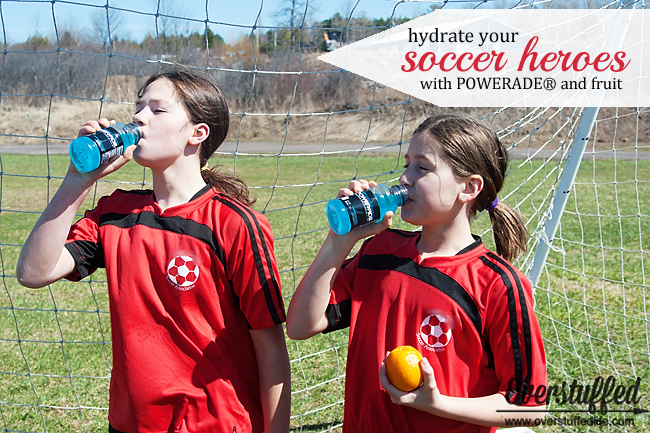 And POWERADE® is an excellent option because it helps our soccer heroes replenish the electrolytes they lose through sweat when they play hard on hot summer days (or even not-so-hot spring days!). Chloe and her friend worked up a pretty good sweat out on the fields practicing together. They were very excited to get their sideline kits and drank up that POWERADE® almost before I could get a good photo! Their oranges didn't last long, either. We are sure looking forward to our season starting, and Chloe is finally feeling like she's practiced enough and is ready! Step 1: Cut your mesh roll in pieces of approximately 10" x 16". Be sure to cut carefully between the meshing so that it stays put together better. Make sure that the selvage side is on a 16" side, as you will want that to be the opening of your bag. Step 2: Fold your mesh piece in half. Sew the bottom and the side, leaving an opening at the top. Use the shortest stitch your machine allows--sewing such holey fabric isn't easy and the shorter the stitch, the better! Step 4: Cut about 24 inches of narrow soccer-themed ribbon (I used 3/8" wide). Be sure to cut the ends at sharp angles to make it easier to thread in step 5. Step 5: Thread the ribbon through the mesh holes around the opening of the bag. I threaded it about an inch or so apart. Tie up your bag in a ribbon and present it to your soccer hero! 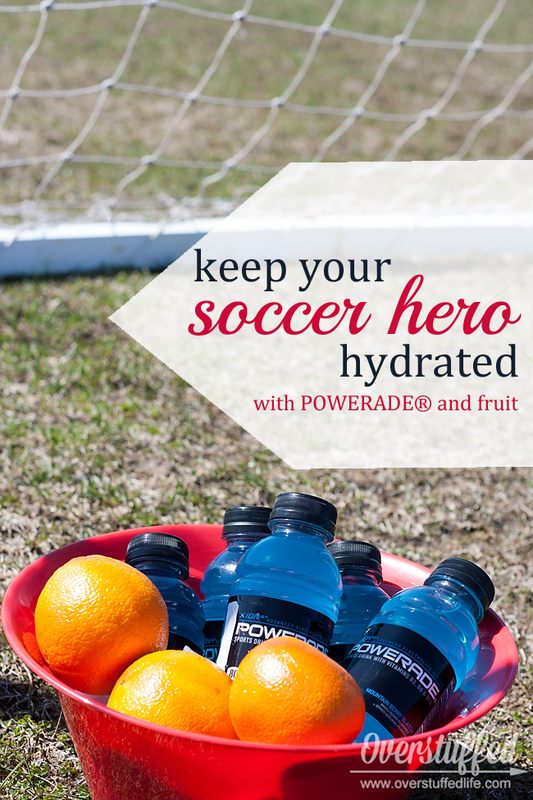 If you want to make your own soccer hero sideline kit with POWERADE® and Walmart Fresh Produce, be sure to look for the coupon on the 12-pack 12 oz POWERADE® packages and you can get $1 off Walmart fresh produce when you buy two 12-pack 12 oz POWERADE®. Hurry this deal is only available while supplies lasts! 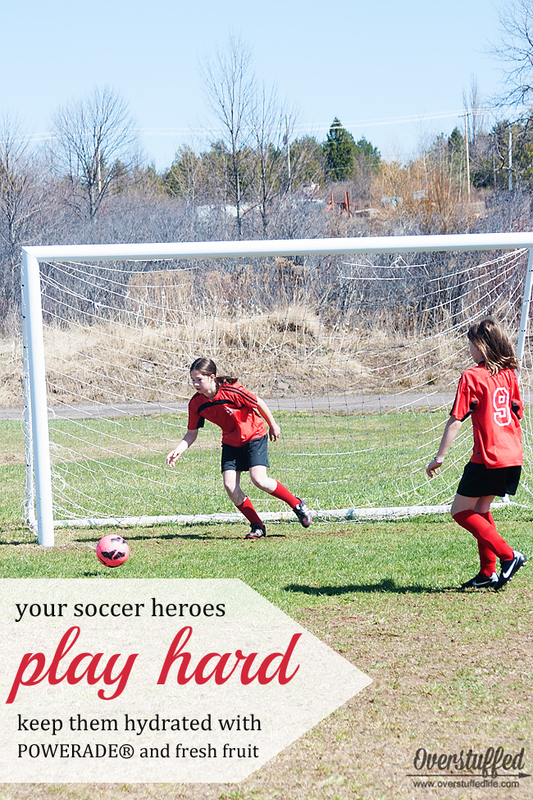 What's your favorite healthy snack to feed your soccer heroes?